Consumers may not be buying brand name PB&J, bacon or SPAM, but they're shelling out for diamond rings, necklaces and lots of clothes. The company said there was "no disruptive effect from the New York flagship store" like there was shortly after Donald Trump won the U.S. presidential election. Tiffany's stock (TIF) was flat on the news but is up more than 15% this year as sales have rebounded. It's not just Tiffany's. People are buying expensive bling at the mall, too. Signet, the operator of mall-based chains Kay, Jared and Zales, reported sales and profits that topped forecasts. Signet also announced it was buying R2Net, the owner of online bridal jeweler James Allen. Shares of Signet (SIG) soared more than 20%. The healthy sales from both Tiffany and Signet provide yet another sign that Amazon (AMZN) and Walmart (WMT)won't completely dominate all aspects of retail. Home Depot (HD) and Best Buy (BBY) are two other traditional retailers that are thriving, for example. Deep discount stores fare well, too. Frugal shoppers helped boost sales and profits at Dollar Tree, which also owns Family Dollar. Shares of Dollar Tree (DLTR) rose 9% on the news. Rival Dollar General (DG) was up 2%. Shares of Guess? (GES) surged more than 15% while PVH (PVH) was up nearly 3%. Another clothing chain might finally become trendy again. Abercrombie & Fitch (ANF) reported sales that beat expectations Thursday morning, sending its stock up 15%. 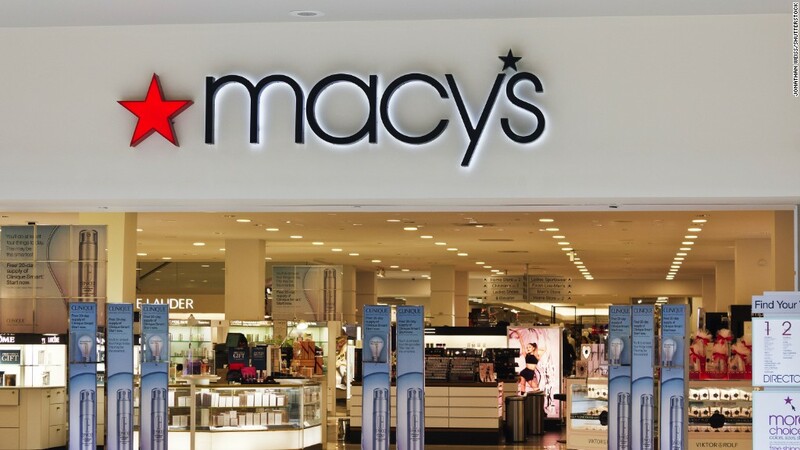 Department stores like Macy's (M), Kohl's (KSS) and JCPenney (JCP) continue to suffer. Sears (SHLD) posted another loss Thursday and announced plans to close more Kmart locations. PB&J giant Smucker (SJM)'s showed Wall Street that even with a name like theirs, things aren't always good. Its stock plunged nearly 8% after sales fell. And Hormel (HRL), the owner of SPAM, Applegate and Skippy, was down 7% on weaker than expected results. But consumers definitely still like to spend time in the kitchen -- even if they aren't buying products from Smucker's and Hormel. Cookware retailer Williams-Sonoma (WSM) reported tasty earnings and sales Wednesday afternoon. Its stock rose 4% on the news.